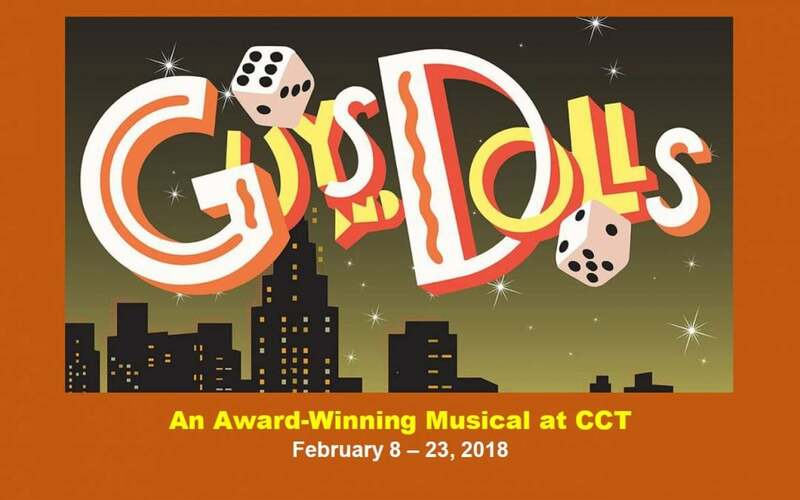 Caribbean Community Theatre’s production of the award-winning musical Guys and Dolls opens on Friday, February 8, 2019 and runs for three weekends through Saturday, February 23rd. 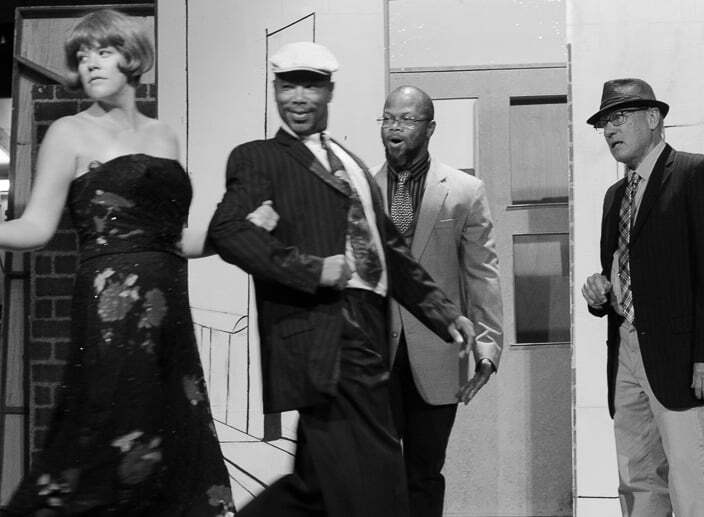 Considered by many to be the perfect musical comedy, Guys and Dolls first opened on Broadway in 1950. It won numerous awards, including Tony Awards, Drama Desks and Oliviers. 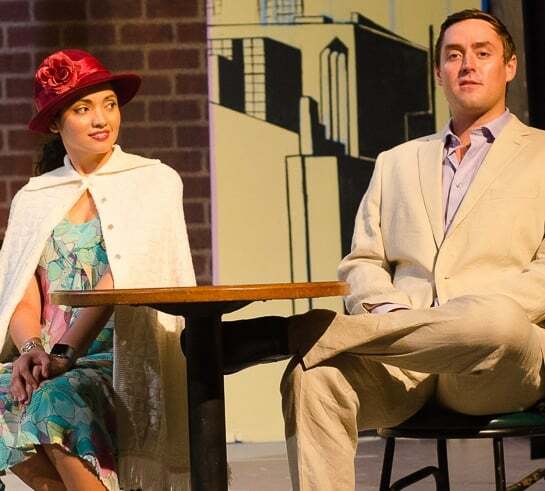 With music and lyrics by Frank Loesser and book by Abe Burrows and Joe Swerling, and set in Damon Runyon’s mythical New York City, Guys and Dolls is an oddball romantic comedy. Gambler Nathan Detroit tries to set up a crap game; meanwhile, his girlfriend, Adelaide, laments that they’ve been engaged for 14 years. Nathan turns to fellow gambler, Sky Masterson, for the dough, and Sky ends up chasing the straight-laced missionary, Sarah Brown, as a result. 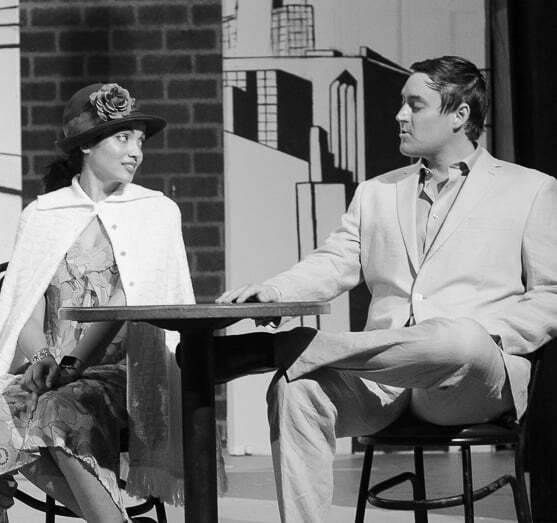 Guys and Dolls takes us from the heart of Times Square to the cafes of Havana, Cuba, and even into the sewers of New York City. 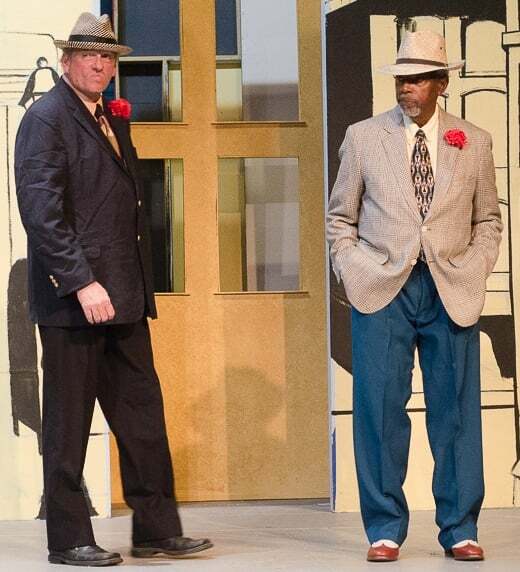 Guys and Dolls is directed by Leslie Highfield Carter (who also plays the part of Adelaide) and Eileen Bishop Des Jardins, with music direction by Patrick Baron and Sean Bailey (also cast as Sky Masterson), with choreography by Anais Alicea, Kemit Amon Lewis and Thalema Williams. Cast in this show are Jacob Coombs as Nathan Detroit and Alisha Udhwani as Sarah Brown, along with singers, dancers and actors, CCT regulars and newcomers to our stage: Vanessa Ayala, Michael Baker, Kirstina Barry, Denise Blanchette, Brianna Campbell, Jack Chandler, Peter Clements, Antonio Cruz, Tony Emanuel, Paul Knipler, Aniis Lester, Jose Maldonado, Abby Moon, John Moorhead, Eduardo Prentice, Jamile Smith, James Racheff, Jim Reese, Kelvin Vidale. In addition, there is a 10-member band playing the gorgeous music. There are seven show dates over three weekends: February 8-9, 15-16 and 22-23, 2018, Fridays & Saturdays at 8 PM, with one matinee on Sunday, February 17th at 4 PM. Ticket prices are $25.00 for adults, with discounts for seniors (age 65+), college students (with ID), students under age 18, and CCT members. 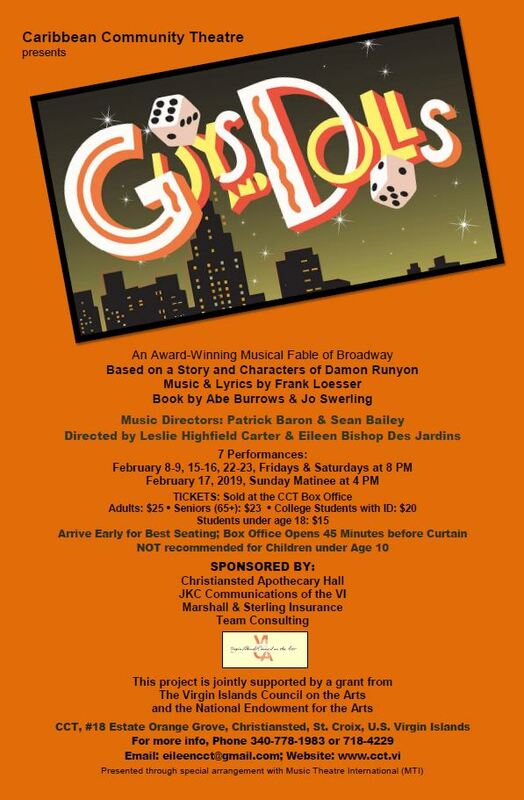 Guys and Dolls is not recommended for children under age 10. All performances are held at the CCT theater at #18 Estate Orange Grove, Christiansted, St. Croix. Tickets can be purchased (for cash only) at the CCT box office, which opens 45 minutes prior to each show. 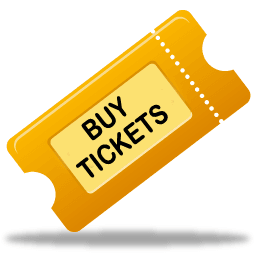 CCT’s musical productions are always popular, so please arrive early for best seating. For more information, visit the theater website: www.cct.vi, or email eileencct@gmail.com, or call 340-778-1983 or 718-4229.